Muscle testing is the key to your animal’s success, whether they have health or behavioral issues. Click here to learn more about what muscle testing is. We can muscle test to determine what holistic methods will best help your animal AND in the order of importance. Besides color therapy (there is always a healing color for an animal), generally an animal will just test strong for 3-4 methods to help it. And keep in mind that muscle testing takes into account what you do NOT know about your animal – things that may have happened before they came into your life, including past lives. 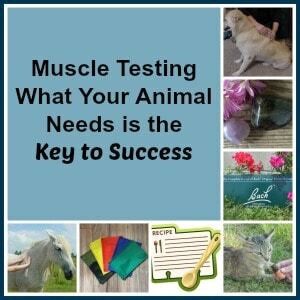 Muscle testing is key because it eliminates you spinning your wheels on methods that cost you time, money and more importantly, your animal’s well-being. Many times when pet parents come to us, they have already invested time and money in trying to help their animal. But this session is also ideal if you are trying to help your animal’s overall well-being and help them to live the happiest, healthiest and longest life possible. Muscle testing helps you determine which methods are going to work best for your animal. A muscle testing consultation is just $20. This muscle testing process gives you a game plan. We spend 30 minutes-1 hour muscle testing, typing up the session notes and answering any questions you may have. We will instruct you how to offer color therapy with your animal’s best color. 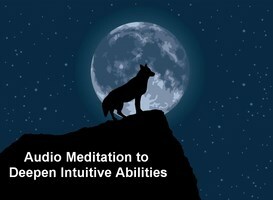 If energy work shows up, we will advise you how to offer basic energy work. Depending on what healing methods show up, we offer additional fee-based consultations such as animal communication, nutrition, custom Bach flower essence blend and custom crystals. You can learn more about those consultations here. Some methods may be those only offered by a holistic veterinarian. You can take the information gained from this basic muscle testing session and determine if you want to pursue anything and with whom. We offer this service by distance or during a house call. We have done this for animals all over the world. For distance sessions, all we need is a photo of your animal to make an energetic, heart to heart connection. If you are interested in learning how to muscle test, we offer an instructional ebook here. Consider becoming a member of our Animal Heart & Soul Learning Center and receive the downloadable ebook and view the 4 muscle testing how to videos as our gifts to you. Click here to learn more about the Animal Heart & Soul Learning Center. If you do not wish to become a Learning Center member, consider becoming a Course Student. The downloadable ebook and viewing the 4 muscle testing videos are your gifts. Click here if you are ready to schedule a muscle testing consultation. Learning Center members please purchase from your Special Benefits box on your home page to access your discount.